Solymar Beach Resort in Cancun, MX is an excellent beachfront option for those traveling on a budget. With close to 300 rooms, Solymar is a sizable resort that can hold large spring break groups. Only being a bus ride away from downtown, Solymar is rapidily becoming one of the most popular and affordable resorts offered in Cancun for spring breakers. Solymar is an all-inclusive resort so do not worry about spending extra money on site. Your resort stay includes an all you can eat breakfast, lunch and dinner buffet as well as unlimited cocktails and snacks throughout the day and night. 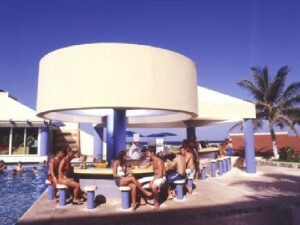 The Solymar Beach Bar and Grill is also open from 9 a.m.- 5 p.m. and offers unlimited cuisine for all resort guests. 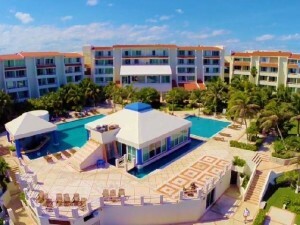 Solymar Beach Resort has two large swimming pools, each with swim-up pool bar perfect for day drinking fun. For the active spring breaker there is daily activities like pool volleyball, contests and games hosted by resort staff. Spring breakers are also granted access to a tennis court where they can get a bit of a workout before their night out on the town. Standard rooms at the Solymar have an authentic Mexican style including 2 double beds, private bath and beautiful views of both swimming pools and the tropical garden landscape. 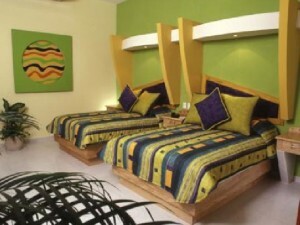 Each room is equipped with air conditioning, television, safe deposit box, telephone and wireless internet. This room is perfect for up to 4 people per room. Don’t let money be the reason you miss out on an unforgettable experience. Choosing Solymar Beach Resort can have you and your friends on their way to a spring break vacation without breaking the bank. Contact STS Travel today to learn more about this budget friendly resort!